Tropical mountains, centers of biodiversity on the planet, face an increasing impact by human land use. In a study extending over eight years we studied the consequences of human land use on the biodiversity and functionality of ecosystems of the largest African mountain. I exactly remember my first trip to Mount Kilimanjaro. We were arriving at the Kilimanjaro Airport at night with a good dozen pieces of luggage – actually all the equipment that we did not dare to put into a container that was shipped to Tanzania. Some puzzled looks at the customs officers – short explanations – shoulder shrugs – and then we were through. The air was warm and humid, and the moon was shining bright when we were rumbling up the bumpy street to our research station in Nkweseko. No one was talking, everyone was dwelling on thoughts. Suddenly the driver stopped and pointed outside. And there it was – the snow-covered tip of Mount Kilimanjaro, reflecting the moonlight. It turned out that we were really lucky that night. Kilimanjaro loves to hide its beauty behind clouds and fog. Only very occasionally, it shows it’s amazing and awing size, rising more than 5000 m up from the savannah plains. Mount Kilimanjaro has been formed by volcanic eruptions through the past three millions year which gave rise to the Shira, Mawenzi and the highest peak, the Kibo. Like other tropical mountains, Mount Kilimanjaro hosts a spectacular sequence of natural ecosystems – from the hot savannah in the lowlands over a belt of dense submontane and cloud forests to the afroalpine shrub vegetation with their fairytale-looking plants. Due to the strong climate gradient found on tropical mountains there is a very high turnover of species making them to the centers of biodiversity on the planet – in fact, there is no place in the world where you find a higher density of species than in tropical mountain regions. The plants, animals and microbes of tropical mountains maintain a large variety of ecosystem functions like water retention, nutrient cycling, carbon storage and pollination from which also human societies – also far away from mountains - strongly profit. 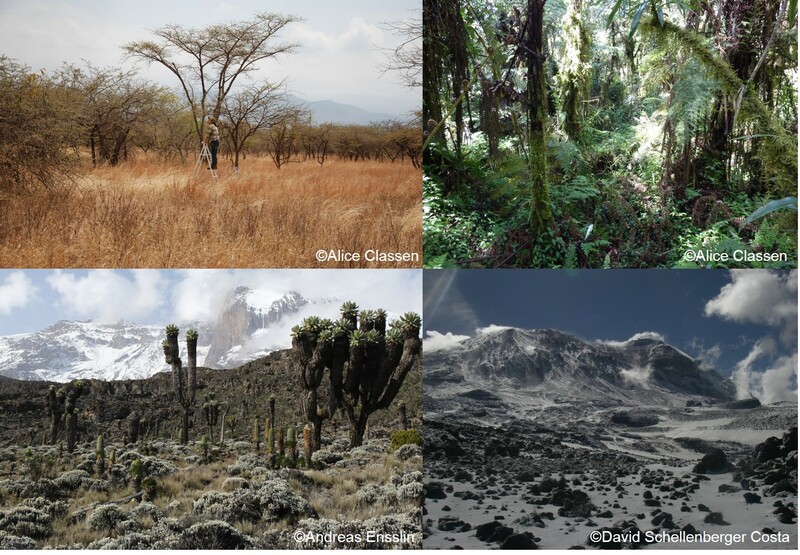 Some ecosystems found from low to high elevations on Mount Kilimanjaro. Clockwise: The savannah in the lowlands of Mount Kilimanjaro at ca. 900 m asl; Campher forests at ca. 2800 m; one of our highest study sites at ca. 4000 m after snowfall; afroalpine vegetation at ca. 3500 m.
However, tropical mountain ecosystems are nowadays under high pressure by human land use. Mount Kilimanjaro has been populated by humans since centuries but the last decades have seen a ten-fold increase in population size which led to an extensive transformation of natural to anthropogenic ecosystems. In a study published in Nature this week we show how land use changes the biodiversity and ecological functionality of the mountain. Tropical mountains like Mount Kilimanjaro are under increasing pressure by human land use. Left: Maize agriculture in the lowlands of Mount Kilimanjaro; Right: Coffee agriculture in the lower mid-elevations. We were interested in the big picture and conducted a massive monitoring of microorganisms, vascular plants and animals - from snails and insects to large mammals. We worked on 60 study sites from the lowlands at 870 m to the highest places where you still find plants growing at ca. 4600 m asl. We also recorded 30 indicators of ecosystem functions such as soil nutrients, plant biomass and decomposition of leaf litter. This was all very laborious as just reaching the study sites often took several days of hiking up the mountain with a full equipment of tents, cookers and food on the back (and the measurement equipment!). Fortunately, our team was large – composed of 50 ambitious PhD students and senior scientists from Tanzania and Europe and supported by a staff of employees from the surrounding villages. The latter worked as drivers, cooks, porters, and field assistants and largely contributed to the success of the project. Field work on the mountain. Clockwise: Camping and preparation of dinner at 3000 m asl; setting pitfall traps in frozen soil at ca. 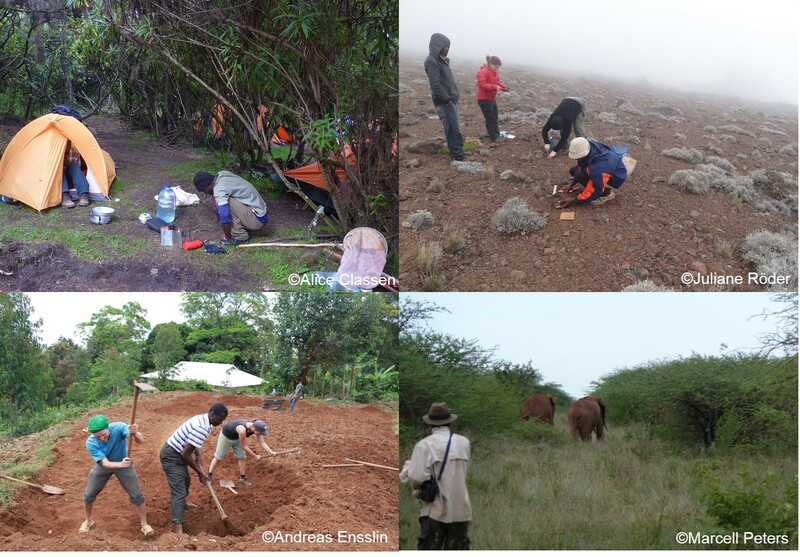 4000 m asl; elephants near one of our savannah study sites; establishing an experimental garden in the highlands. After six years we were able to compile a huge data set which gives us a good impression on the ‘ecological pulse’ of tropical mountain ecosystems and how it is impacted by human land use. We could show that land use strongly changes the ecology of the mountain as it decreases the number of species by up to 50%, leads to a pervasive turnover of species communities and strongly modifies the ecosystem functionality. A major finding of our study was that the effects of land use were not homogeneous in all elevation zones but that ecosystems found in harsh climates (the arid savannah and the cold montane elevation zones) are more vulnerable to land use intensity than those under a more ‘temperate’ climate. We hope that our study will contribute to a better understanding of the influence of global change on tropical mountain ecosystems - in order to protect their fascinating biodiversity in the long run.